November 29, 2010 - The FAA has issued its first license permitting the reentry to earth of a privately developed spacecraft to the Space Exploration Technologies Corp. (SpaceX) The Space X Dragon space capsule will launch atop their Falcon 9 rocket on December 7 and return to earth. While initially unmanned, the mission is a precursor to NASA and SpaceX efforts to eventually provide commercial trips to the International Space Station with cargo and crew. The FAA is responsible for regulating and licensing U.S. private companies and individuals involved in commercial space transportation. To date, the FAA Office of Commercial Space Transportation has licensed over 200 successful launches. An FAA license is required for any launch or reentry, or the operation of any launch or reentry site, as carried out by U.S. citizens anywhere in the world, or by any individual or entity within the United States. An FAA license is not required for space activities the government carries out for the government, such as most NASA or Department of Defense launches. Once the FAA determines a license application package is complete, the FAA has 180 days to complete an evaluation and issue or deny a license. The FAA evaluation includes a review of public safety issues; the activity?s environmental impact; any payload to be flown; any national security or foreign policy concerns, and whether or not the commercial space operator is appropriately insured. To help facilitate in the eventual licensing process, the FAA can issue experimental permits, rather than licenses, for the launch or reentry of reusable suborbital rockets. Experimental permits are issued for research and development; demonstrating compliance with requirements leading to licensing; or crew training prior to obtaining a license. No person may operate a reusable suborbital rocket under a permit for carrying any property or human being for compensation or hire. When an FAA licensed space activity is scheduled, FAA safety inspectors will attend even if it takes place outside the United States. The FAA has the authority to suspend or revoke any license or issue fines when a commercial space operator is not in compliance with statutory or regulatory requirements. NASA statements on FAA granting reentry license to SpaceX, "congratulations to the SpaceX team for receiving the Federal Aviation Administration's first-ever commercial license to reenter a spacecraft from Earth orbit," NASA Administrator Charlie Bolden said. "With this license in hand, SpaceX can proceed with its launch of the Dragon capsule. 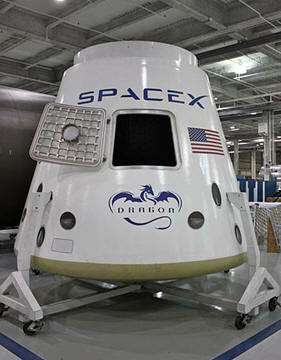 The flight of Dragon will be an important step toward commercial cargo delivery to the International Space Station. NASA wishes SpaceX every success with the launch." "Milestones are an important part of space exploration and SpaceX achieved a very important one today," said Doug Cooke, associate administrator for NASA's Exploration Systems Mission Directorate. "I congratulate SpaceX on this landmark achievement and wish them the best with their launch of the Dragon capsule. ?